Many thanks to Norbert Haché, Derek Dunnett, Brian Belliveau, and Margaret Hart for being a part of the Eastern Ontario Birding warbler Big Day on 27 August 2016. 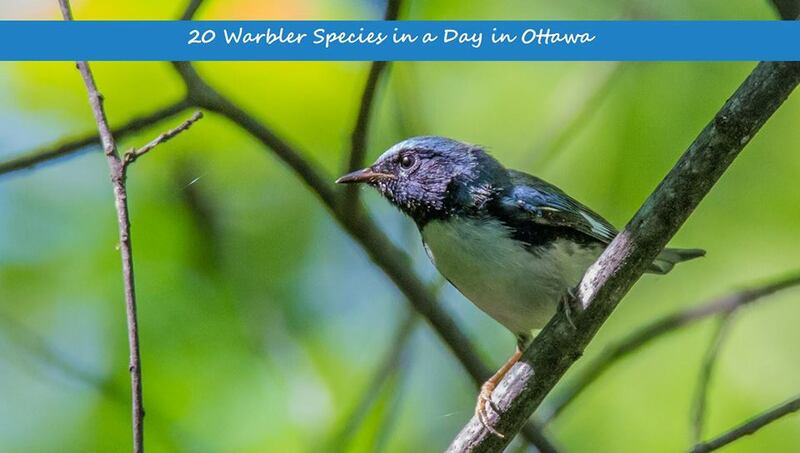 My first ever 20 warbler species day in the Nation’s Capital! We birded Britannia C.A. then moved west to Shirleys Bay Trail 10. Throughout the day we tallied 20 species of warbler; 17 species of at Britannia then 3 more at Shirleys Bay (Common Yellowthroat, Northern Parula and Black-throated Blue). Species list: Ovenbird, Northern Waterthush, Black-and-white, Tennessee, Nashville, Common Yellowthroat, American Redstart, Cape May, Northern Parula, Magnolia, Blackburnian, Yellow, Chestnut-sided, Black-throated Blue, Bay-breasted, Pine, Yellow-rumped, Black-throated Green, Wilson’s and Canada. Photo: Norbert Haché’s excellent capture of his lifer view of a male Black-throated Blue Warbler. Shirleys Bay area, Ottawa, Ontario.